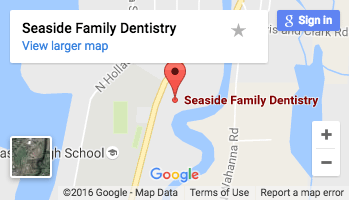 Your Oregon coast dentist at Seaside Family Dentistry has something for you to chew on – The health of your teeth, gums, and mouth can tell a pretty complete story about the current state of your overall health. That’s because gum disease has been linked with a variety of potentially serious health problems. What’s truly concerning is that roughly half of all adults in the U.S. suffer from some level of gum disease, making the disease a potential health risk for millions of people. Unlike many other diseases, gum disease doesn’t actually manifest any symptoms until it has progressed to a far more serious state. Gums that appear red, swollen, puffy, or that bleed easily after brushing are potentially showing the signs of gum disease. Patients who suffer from gum disease have a higher risk for developing coronary heart disease, according to a study published in the American Heart Journal. The disease causes a continuous infection to take root in your gum tissue, which creates a buildup of bacteria and inflammation that can begin to spread to other areas of the body, especially the heart. In fact, a variety of bacteria responsible for causing gum disease have also been identified in arterial plaque, according to another study published in the American Journal of Preventive Medicine. Why researchers have yet to conclusively prove what connects these seemingly unrelated diseases, they do have a compelling theory. Cracks in gum tissue that develop as a result of gum disease allow harmful oral bacteria to enter the bloodstream where it travels to other parts of the body, such as the arteries of the heart. Once rooted there, the bacteria cause the same type of plaque buildup and inflammation that causes gum disease, resulting in the development of heart disease. A recent study published in BMJ Open Diabetes Research and Care found that individuals with gum disease had a 23 percent higher risk for developing type 2 diabetes when compared to study participants that did not suffer from the disease. However, researchers involved in the study were quick to point out that correlation does not equal causation. In other words, gum disease does not cause diabetes, but rather plays a role in a domino type effect. Gum disease causes the body to release proteins that cause inflammation, which can cause blood vessels to become irritated and a buildup of plaque. These proteins can also contribute to high blood sugar levels, which can in turn eventually lead to the development of diabetes. When put a little more clearly, researchers believe that poor oral health leads to problems managing blood sugar levels and more persistent problems with diabetes. Some studies have even linked plaque buildup in the heart to problems in the brain, according to the North American Journal of Medical Sciences. This connection could potentially increase an individual’s risk for Alzheimer’s disease. Researchers believe that the inflammatory proteins released as a result of gum disease can reach the brain, along with a C-reactive protein, a substance produced by the liver that can act as a marker for inflammation and disease in the body. However, more research is needed before this potential connection can be better understood. Studies have linked gum disease to complications during pregnancy, including limited fetal growth, low birthweight, and pre-term birth. While this connection may seem startling, it generally just means that pregnant women need to make a greater effort to floss. Researchers believe that oral bacteria can travel through gum tissue into the bloodstream, moving the way down to the uterus. Once there, the bacteria trigger an increase in prostaglandin, a labor-inducing hormone that can cause problems with fetal development and delivery. Fortunately, by practicing quality oral hygiene habits such as flossing, pregnant women can reduce the bacterial buildup most commonly associated with these types of issues. Could Your Toothbrush Contain a Dangerous Chemical?